Witch World is a fantasy or science fiction novel by Andre Norton, published as a paperback original by Ace Books in 1963. It inaugurated the Witch World series and established a setting that she eventually shared with other writers. The first hardcover edition was published by Gregg Press of Boston in 1977 as #1 in a set of seven called "The Witch World Novels of Andre Norton". Later it appeared in three-novel omnibus editions and in audiobook. During World War II, Simon Tregarth had risen from a common soldier to the rank of lieutenant colonel. In post-war Europe, he had become involved, almost accidentally, in the black market, only to be caught and discharged in disgrace from the military. He had also managed to anger a powerful criminal organization enough for it to send assassins to dispose of him. After months on the run, he knew his time was running out. Then, Tregarth is contacted by Dr. Jorge Petronius, a man with an amazing reputation for hiding men in dire straits. Petronius recounts a fantastic tale of a stone of power, the Siege Perilous of Arthurian legend, that has the power of opening a gateway to a world attuned to the person who sits on it. Disbelieving, but with little to lose, Tregarth gives up all the money he has left and is transported to a land where magic vies with more mundane swords and bows. He arrives in a nearly empty countryside, just in time to witness a savage hunt: a lone woman being chased down by hounds followed by two horsemen. Tregarth rescues the witch Jaelithe and enters the service of Estcarp, a land ruled by witches and threatened by many enemies. One of these is the land of Gorm, which was bloodily taken over by the far-off, mysterious realm of Kolder. Estcarp's sole trusted ally is Sulcarkeep, a nation of seafaring traders. When Magnis Osberic, leader of Sulcarkeep, requests help against a common enemy, Tregarth and Jaelithe join a party of warriors sent to its aid. On the way, they are ambushed by men of Gorm who appear to be controlled by some unseen entity. The attack is defeated. Afterwards, Koris, Captain of Escarp and refugee from that land, recognizes some of the bodies. The group reaches the island fortress of Sulcarkeep. However, most of the Sulcarmen are away in the season of trading, and an attack overwhelms the few defenders. While a handful of survivors flee in small boats, Osberic remains behind to blow up the island, taking many of the enemy with him. The violence of the explosion causes the tiny vessels to founder; Tregarth and Jaelithe both reach land, but become separated. Jaelithe is captured by Fulk of Verlaine, a coastal lord, but is helped to escape by Loyse, his only daughter. Together, the two women make their way to Kars, the capital of Karston, Estcarp's restive southern neighbor. Tregarth, guided by a mental link with the witch, is reunited with her there. Soon afterwards, Karston erupts in a frenzy of killing aimed at those of the Old Race, the principal ethnic group of Estcarp. Tregarth, Jaelithe, Koris and Loyse flee the carnage. Tregarth organizes a guerrilla force using his prior military experience, but is caught and shipped to Gorm to be turned into a mindless slave, like others he has already encountered. Fortunately, he is able to escape. The witches of Estcarp launch an attack on the capital city of Gorm. When Tregarth fights and kills the enemy leader, during the intense struggle, he inadvertently achieves a mental rapport with his opponent and learns that the people of Kolder are like him in some respects; they are a small number of refugees from another universe, though one with a higher level of technology than Earth. Estcarp is victorious, but the threat from Kolder remains. 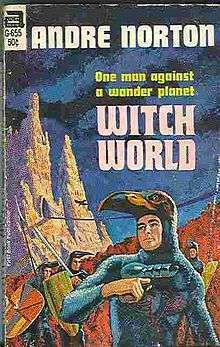 Witch World was nominated for the 1964 Hugo Award. 1 2 3 4 Witch World Universe series listing at the Internet Speculative Fiction Database. Retrieved 2013-06-21. Select a title for linked publication history and general information. Select a particular edition (title) for more data at that level, such as a front cover image or linked contents. ↑ "1964 Award Winners & Nominees". Worlds Without End. Retrieved 2012-01-17. Tuck, Donald H. (1978). The Encyclopedia of Science Fiction and Fantasy. Chicago: Advent. p. 332. ISBN 0-911682-22-8.